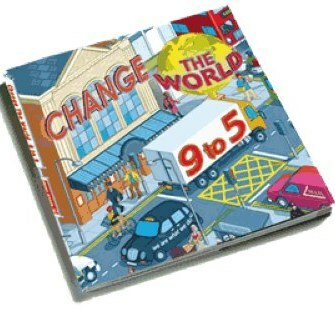 Those nice people at We Are What We Do, who brought us 'Change the World For a Fiver', have got a new book out - called 'Change the World 9 to 5'. It's as packed full of ideas about how to live better and make the world a more peaceful, less damaged, more connected place... Go buy - it makes a great (protest/ ethical) Christmas gift. Which is your own personal favourite or the one that resonates with you the most? GH - There are so many wonderfully moving heart quotes. (I have a section on my website dedicated to them!) One of my favorites is by Thomas Moore: “The heart has its reasons.” This quote resonates with me, especially lately, because I have found myself wondering why my heart is leading me down a path that my head doesn’t agree with. The quote speaks to me about life’s mystery—that life is not a problem to be solved but, rather, a mystery to be lived. I take comfort in this awareness, because my mind is always trying to figure everything out, so it can control things. How freeing to trust ones inner awareness and not have to have it “all figured out” Sometimes it just can’t be figured out! LHD - In the book, you make a lot of our spiritual relationships with a 'higher power', the Universe, that still small voice - can you say a little about your own spiritual journey and where you are now? GH - More than ever, I am aware that when I trust myself (or my heart’s wisdom) I am trusting God, the Cosmos, or a higher power. In other words, I am being guided from within by this power. It has sometimes been difficult for me to remember this truth recently, with regard to some career and health issues—even though from past experiences I know that it is true. This is because my fear gets hold of me and blinds me. But I realize that when I can remember this simple but profound truth, it makes it easier for me to trust myself. LHD - I'm part of a faith community which is committed to a holistic spirituality of the heart, soul, mind and strength. What's your take on how the other three of these relate to the heart? GH - Like you, I would use the term “holistic” to describe the relationship between these facets of ourselves. To me, “spirituality” means “oneness.” I believe that through the heart we receive messages and are guided by a higher power. It is also how we experience love and our “oneness” with all things. Our soul, the nonphysical part of us, evolves as it is guided by this power. Our mind, the place where our thoughts reside, helps us to live and communicate as physical beings on earth. Strength is defined as the power we attain by having all these aspect of ourselves in sync, and in sync with God’s flow. David Runcorn has just had his latest book published : Spirituality Workbook : A Guide for Explorers, Pilgrims and Seekers : I've had a good look through my copy and it's a real mix of stories, thoughts, meditations and exercises for those wanting to start or continue a journey through the 'many facets of Christian spirituality'. It is broad enough for there to be something for everyone; from those just beginning to question and explore, to those whose journey is many days and nights old. I know David personally as a man of great peace and no little wisdom and would not hesitate to recommend his guidance to any seeker wherever you are on your spiritual journey!